Medicine Buddha in Wood Finish. IN OUR BUDDHA STATUE SHOP, INDIA; FIND THIS UNIQUE 17 INCHES MEDICINE BUDDHA IDOL IN WOOD FINISHED BRASS. BUY BUDDHA STATUE, PRODUCT NO. BS003 FROM OUR BUDDHA BAZAAR, DHARAMSHALA. BROWSE FROM OUR COLLECTION OF BUDDHA IDOLS INDIA. Product no. 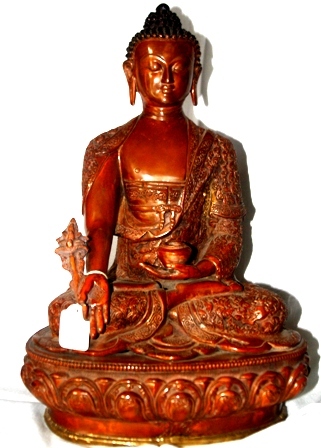 BS003 is a finely carved, hand made Healing Buddha Brass Statue with Wood Finish. In our unique range of hand-crafted Buddha Idols India, this 17 inches figurine in Buddha Bazaar represents the Supreme Healer(or Sangye Menla in Tibetan). He holds the Vase of Healing in his left hand which symbolizes the nourishment of the soul and the curative herbs of healing in his right hand. The practice of the Healing Buddha on his lotus throne is used for initiating the curative powers of the Buddha in your life. The Buddha Idol can be placed in a prayer altar in your home or in your garden from where it will radiate its healing powers for oneself and for others. The meditation of this Buddha can help you overcome the inner sickness of hatred and ignorance. Praying to the Medicine Buddha is considered to be extremely powerful for healing of physical illnesses and purification of negative karma. Buy Buddha Statue, BS003, to usher good health in your life. Height: 17 inches, Length: 11 inches. Price (inclusive of Buddha statue and Mantra Scroll): INR 32,000. 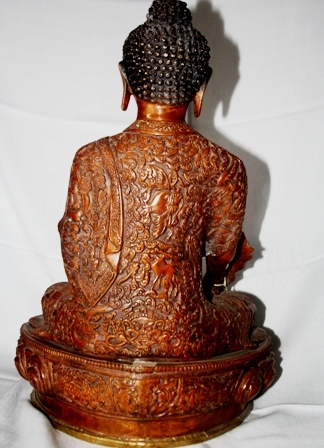 Like the information on our Medicine Buddha in Wood Finish figurine, visit us here for more information on Buddhism.